Last year’s SU President Orlaith Cunningham has everything you need to know if you’re heading down to Mary Immaculate College. What’s the local area like? Limerick is a vibrant city with a great nightlife. The people are lovely and you will definitely meet some characters during your time here if you decide to study in MIC. Students who decide to study in Mary I are so lucky as they really do have the city on their doorstep. There is a huge variety of things for you to do in Limerick between the Cinema, bowling, shopping, art exhibitions, graffiti clubs and without a doubt, if you are in to pubbing and clubbing, you won’t be short of options that are fun and affordable. There is also a huge selection of places to eat in Limerick and in the area around MIC. If you fancy something to eat fast you can eat on campus or else you have everything from Supermacs to Milanos to cater for your taste-buds in the city, which will inevitably become your second home. What’s the story with accommodation? How expensive is it? There is a great choice of accommodation in MIC. The on-campus accommodation is mainly reserved for first year females and is a safe and excellent way to get started in College, especially if it is your first time away from home. Next to the college, there is a choice of Courtbrack, Ashdown, Allandale, Fitzhaven and Castlewell Accommodation. All these apart from Courtbrack offer student apartments. If you fancy a walk, City Campus is a safe student village that is only 10 minutes away from MIC. The majority of these student accommodations range in price from €4,000- €5,000 a year. There is also a huge selection of houses around MIC which can vary from €60- €90 a week depending on how close it is to the college. For info on houses, check out www.misu.ie or www.mic.ul.ie and look under accommodation. The cost of living depends on what kind of living you are at! The best thing to do is to see how much you can afford per week and budget around it. If you set aside money for food and bills, then things will go a lot smoother and you will be able to make the most of your college experience. Look in Tesco and other supermarkets for special offers and don’t forget to shop around. In terms of college expenses, books are one of the biggest expenses you will have at the start of both semesters. If in first year, if you aren’t going to keep on certain subjects for the rest of your degree, photocopy the section of the books you need. Or else you could borrow them from the library. In terms of eating out and clubbing, a lot of places do really good student offers and make sure to look out for certain student nights in Limericks’ clubs as a lot of them will let you in for free before a certain time. Make sure you bring your ID with you though or you won’t be getting in anywhere! Is part-time work easy to come by? Like any place in Ireland, part time work realistically is hard to come by. However, if you hand in your CV’s at the end of summer / start of September, a lot of shops etc. will keep your CV on file. Also, a lot bars around the city and beside the college like to take on students for the year, if that is the kind of work you are looking for. What are campus facilities like? Computers / Library / Banking / Residential Accommodation? Facilities in Mary I are constantly developing. We cater for everyone with computer labs, an on- campus bank and ATM and even on-campus accommodation. With the opening of the new college building this year, MIC is proud to show off its brand new 500 seater theatre /auditorium, along with all new state of the art lecture halls. We even have a brand new shop for getting something on the go! What kind of sports facilities are there? In terms of sporting facilities, we host a number of number sports, ranging from Soccer, Badminton, GAA, Rugby, Equestrian, Dodge ball and Tag rugby to Tae Kwon Do. We also have a variety of classes such as Boxercise, Aerobics, Yoga, Pilates and Hip Hop dancing. MIC is, without a doubt, a sporting college and has been very successful in competitions of the sporting kind, including the Ryan Cup and Duggan Cup. What’s the grub like? Good food? Variety? The food on campus is fantastic in MIC. There is a choice between the college restaurant and the college shop. There are brilliant meal deals everyday such as a full dinner with tayto and a drink for only €3.50! If you want to eat off campus, there is a huge selection of places to eat. You have a choice of all the city hotspots that will give you brilliant student offers! What kind of clubs and societies can students join? There is a huge selection of clubs and Socs in MIC. We have a Clubs and Socs day at the start of each semester so students can get information about all the clubs MIC has to offer. 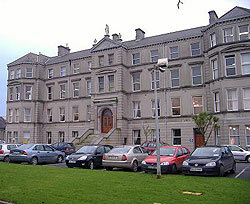 Clubs and Socs in the college include: MIDAS (Mary I Dramatic Arts Society), Video game society, St. Vincent De Paul, The Poker Society, The Golf Club, Equestrian, The Soccer club, The Rugby Club, Macra na Feirme, Magic Society, Badminton, Dodge ball, Cake and Marshmallow, The History Society, The One world Society, The Philosophy Society. As you can see, this is only a taste of the Clubs and Societies Mary I have to offer, and even if there is a Club or Soc you don’t see there, we would be happy to set it up for you! What advice would you offer new students? The first thing I would tell students is NOT to be afraid. College is a scary time for everyone. Everyone will be feeling nervous during their first week or two. It’s only natural. So make sure you get involved. Talk to someone and try make friends. Everyone is in the same boat and would only love to make new friends. Get out and get involved, join Clubs and Socs and go to the events organised by the students union for ye. Everybody in Mary I is friendly and we would hate for anyone to come to MIC and not enjoy and make the most of their time here! As the saying goes, we’re here for a good time, not a long time! What’s the “worst thing” a new student can do? Not speak to anyone! If you need help ask someone. Everyone loves to help in MIC and no matter how big or small the issue or question- always ask! Make sure to pop down to the Students’ Union for a chat. We only love people coming down getting to know us! Asking questions and for help! Talk to people and get out and about- we don’t bite! Any other useful stuff you would like to add? If you decide to come to Mary I you are choosing a different kind of College experience. If you decide to come to Mary I, you are becoming part of a big family. Everyone knows everyone in MIC- even the staff and students! I know this is hard to believe with over 3,000 students in the college but the atmosphere is friendly and even if you don’t talk to anyone, somebody is bound to talk to you! I loved my time here in Mary I and I wouldn’t change a single thing about it! You make friends and memories that will stay with you for the rest of your life!